Leave your Crete hotel by air-conditioned coach and travel to the Minoan Palace of Knossos, one of the island’s showstopping historical attractions. The original site is believed to have been built around 1900 BC, but – following an earthquake – it was rebuilt on a grand scale, and lavish royal quarters, shrines, treasuries and storerooms were added around the Central Court. After paying your entrance fee, head inside to explore the reconstructed site that was brought to life from a series of 20th-century excavations by British archaeologist Sir Arthur Evans. As you walk, listen to tales and trivia about the palace’s glory days during the Minoan era – a Bronze Age civilization that made Knossos its capital. 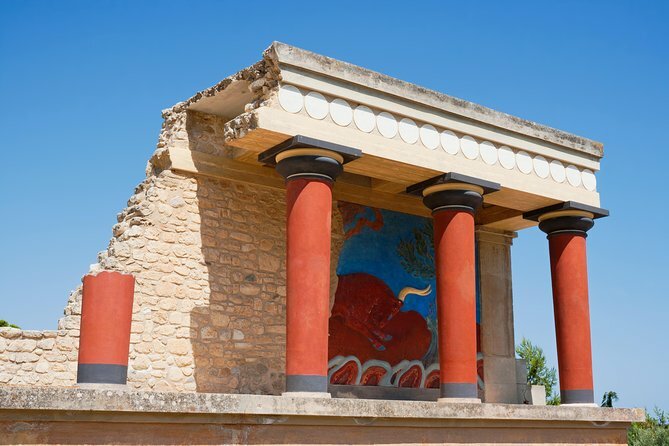 Greek mythology was ingrained in Minoan culture, and the Palace of Knossos featured in many popular tales such as the famous myth of Theseus and the Minotaur. Hear of legends and Greek folklore while exploring areas of the palace like the Throne Room, home to frescoes of the Minoan’s sacred mythical beasts. Wander through the Central Court and gaze up at sights like the Grand Staircase. See an impressive fresco of rampaging bulls, and explore the corridors and labyrinth-like alleyways that lead to intriguing rooms such as the Theatral Area – a place that may have once existed as a theater. Your day trip finishes with a hotel drop-off. The visiting to the Minoan Theater is only for participants for the Areas 2, 3, 4, 5.